Solidarity Painting removes and replaces failed sealants with the highest grade materials. Improperly installed sealants can be very costly for everyone involved. Caulking and sealants help protect and waterproof a structure by ensuring water stays on the outside of the building. Window perimeters, building panels, and other joints are the primary areas that require special caulking in order to create a moisture barrier, while allowing for natural structural movement. 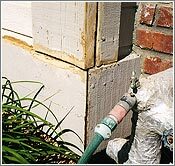 Every joint of a home or building needs to be sealed and made waterproof. A good caulking job combines meticulous preparation, the proper application of backing rods and sealant, and expert tooling to achieve a seal that is both aesthetically pleasing and waterproof.